Reprint. This translation originally published: 1995. "It is thus important to a) fundamentally purge the Finance and Gosbank bureaucracy, despite the wails of dubious Communists like Briukhanov-Piatakov; b) definitely shoot two or three dozen wreckers from these apparaty, including several dozen common cashiers. "- J.
Stalin, no earlier than 6 August 1930"Today I read the section on international affairs. It came out well. The confident, contemptuous tone with respect to the great powers, the belief in our own strength, the delicate but plain spitting in the pot of the swaggering great powers-very good. Let them eat it."-J. Stalin, January 1933 Between 1925 and 1936, a dramatic period of transformation within the Soviet Union, Josef Stalin wrote frequently to his trusted friend and political colleague Viacheslav Molotov, Politburo member, chairman of the USSR Council of Commissars, and minister of foreign affairs. In these letters, Stalin mused on political events, argued with fellow Politburo members, and issued orders. 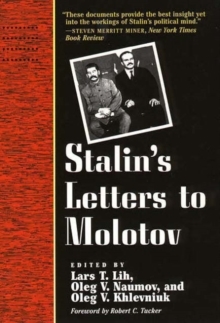 The more than 85 letters collected in this volume constitute a unique historical record of Stalin's thinking-both personal and political-and throw valuable light on the way he controlled the government, plotted the overthrow of his enemies, and imagined the future. This formerly top secret correspondence, once housed in Soviet archives, is now published for the first time. The letters reveal Stalin in many different and dramatic situations: fighting against party rivals like Trotsky and Bukharin, trying to maneuver in the rapids of the Chinese revolution, negotiating with the West, insisting on the completion of all-out collectivization, and ordering the execution of scapegoats for economic failures. And they provide important and fascinating information about the Soviet Union's party-state leadership, about party politics, and about Stalin himself-as an administrator, as a Bolshevik, and as an individual. The book includes much supplementary material that places the letters in context. Russian editor Oleg V. Naumov and his associates have annotated the letters, introduced each chronological section, and added other archival documents that help explain the correspondence. American editor Lars T. Lih has provided a lengthy introduction identifying what is new in the letters and using them to draw a portrait of Stalin as leader. Lih points out how the letters help us grasp Stalin's unique blend of cynicism and belief, manipulation and sincerity-a combination of qualities with catastrophic consequences for Soviet Russia and the world.